Florence Becot and David Conner study the economics of sustainable food systems. The importance of buying local food receives a lot of lip service among proponents of sustainable food systems, but what value does buying locally actually provide to local economies? And how can an institution know whether their purchases of local food are really helping local farms and communities? That’s the question Diane Imrie, director of Nutrition Services at University of Vermont Medical Center, wanted to answer about the hospital’s local food procurement program. She enlisted the help of David Conner, associate professor in UVM’s Department of Community Development and Applied Economics, who studies the economics of sustainable food systems. David, in turn, brought on Florence Becot, research specialist at the UVM Center for Rural Studies, who is also a doctoral student in the UVM Food Systems Graduate Program. 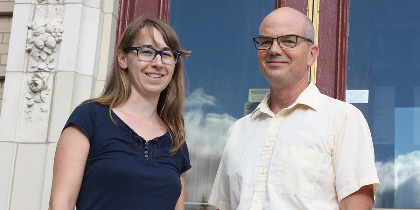 Conner and Becot looked at the hospital’s purchasing data from 2012 to understand how the impact of local food purchases rippled into the local economy. Their results show the valuable role UVM Medical Center plays in the Vermont economy: the hospital’s $1.6 million in local food purchases contributed to $1.1 million in additional economic activity in Vermont in 2012. The research also highlights how producers obtain additional benefits from their association with the hospital, which further supports their businesses. The study was recently published the Journal of Foodservice Management & Education: Assessing the Impacts of Local Hospital Food Procurement: Results from Vermont. So how do these local purchases result in additional economic activity? One of the primary ways this value occurs is by preventing economic “leakage” from the Vermont economy to companies outside the state. The idea of leakage is based on the concept that a portion of any purchase from a company based outside Vermont will leave the state’s economy. So if you buy a tomato at a chain grocery store, for example, even if that tomato was produced locally, some portion of your money inevitably goes to corporate profits out of state. Purchases from local producers and distributors, on the other hand, will keep more of the money circulating locally. When you subtract the costs of production that go to purchasing inputs like fuel and imported fertilizers, a greater portion will stay local. Conner and Becot were able to quantify that portion that stays in the local economy by using economic modeling tools that estimate the value of money flowing into specific sectors of the economy. Due to an economic factor called the “multiplier effect,” they showed that every dollar UVM Medical Center spent on local food generated an additional $0.38 to $0.68 of value for the local economy. But they didn’t stop there. As they learned about the hospital’s foodservice, Conner and Becot realized there was an interesting story to tell about the experiences of both the vendors who sell to the hospital and the people who eat there. So they added on a qualitative piece to the study, which involved interviews with producers, distributors, and customers. One of the findings from their conversations from producers was that the hospital serves an important supply chain development role. Imrie and her colleagues help farmers transition into selling to wholesale markets by getting them up to speed, then buying from them. For example, they have provided direct financing for infrastructure to increase a farm's production capacity. Once a producer is an established vendor with the hospital, it sends a message to other potential buyers that the producer is wholesale ready. If a vendor has a successful relationship with a hospital, an institution that requires consistency and quality, this indicates they are sophisticated enough to sell to other wholesale buyers. In this way, the association with the hospital’s supply chain lends a certain prestige. On the consumer side, Conner and Becot learned that while patients are served from the same kitchens, the majority of the hospital’s customers eat at the hospital’s retail locations. Most of these are employees of the hospital, some are visitors to the hospital, and the remainder are UVM staff, faculty, and students who are drawn by convenience, quality of food, and low prices. 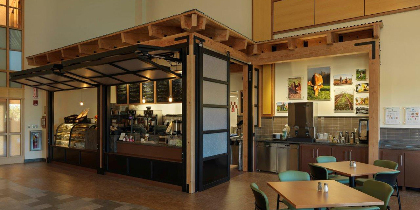 UVM Medical Center has received national recognition for its leadership in dining innovation. 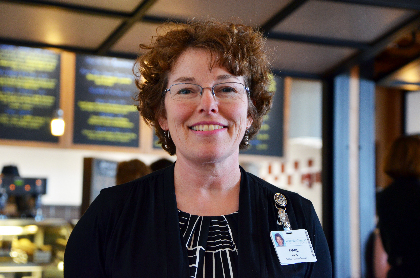 As one of the first hospitals in the country to sign the Healthy Food in Healthcare pledge, Imrie’s team has been thinking creatively for over a decade about how to move towards healthier, local, and sustainable menus. In 2013, the hospital won the “Sustainable Food Procurement Award” from Healthcare Without Harm, a national organization that promotes sustainability in healthcare institutions. This year, they were recognized with a “Silver Plate Award” from the International Foodservice Manufacturers Association. Every dollar UVM Medical Center spent on local food generated an additional $0.38 to $0.68 of value for the local economy. Diane Imrie and her team buy locally because it gives them an opportunity to "personally interact with many local producers." Photo courtesy of the University of Vermont Medical Center. The Garden Atrium, which opened a year ago, features local and fresh produce. Photo courtesy of the University of Vermont Medical Center.